Join Us with JAY ROUSE This Summer! Notice anything different about us? We’ve launched our newly redesigned website for musicians and educators to compare all music options, organize titles for personal and professional use, and share their passion for musical expression. The new website is designed to improve your search results and reduce research stress. “We’ve been working on this website for three years now. The features we are most excited for are the advanced search bar and music-specific filters that offer you more opportunities to find sheet music that fits your educational or performance goals,” said David Ginter, technical manager. Our search bar is optimized for music specific searches. You can search by instrument, voicing, keyword, full title, composer, artist, arranger, series, or catalog number. However, remember – less is more. If you want to be even more specific, click on our advanced search and type in as much information as you have. If you still have too many results after hitting enter, click on the photo to the left to reveal the filter! All you’ll have to do is chose the tab you want and it will grow to show you how every item is grouped. Say you searched the word “Star,” but you only want to see SAB music – the voicing tab will tell you how many SAB selections are in this search. We are also introducing new Social Media and Reprise pages. These pages archive our social and email announcements to allow our non-social media users access to our news and product recommendation. You can check in with the Social Media page for a weekly snapshot of what’s happening at Stanton’s and easily follow us without ever logging in. You can stop scrolling back months at time to find that email with that title you can’t remember the name of, but you know would be perfect! Visit our Reprise page and only look through our emails without any distractions. “The website is a resource where music directors can easily see, listen, and learn new products that best fit their ensemble needs. What we’ve created is a large music library database. With that database we can help directors and musicians compare ideas, organize their selections, and share with their ensemble and the audiences they reach,” says President, Eric Strouse. 1) Make sure that your student is playing from an original copy, not a photocopy, of music (even if you have purchased the music, copying it and playing from a photocopy is an infringement of copyright law). 2) Similarly, make sure the judge has an original score (with measures numbered!) from which to read. Copyright is a challenging but important subject in music education. Most of us have a very limited understanding of it, and have had no formal training or education provided, yet it applies to every facet of being a music educator. Literally meaning the right to copy or reproduce, copyright law is designed to protect creators from having their works essentially stolen rather than purchased. Education has a very special caveat regarding copyright law, fair use, however, this does not mean unlimited use or reproduction. While this special relationship complicates our understanding, it makes it all the more important to know what is permissible and do what is right. Likewise, ever-changing digital technology and the internet make copyright that much more complicated and important. Thankfully Alfred’s new Copyright Handbook for Music Educators and Directors provides us with a guide geared especially for the classroom and rehearsal hall. Written by music education industry professionals, it provides a very practical approach to copyright law as it applies to performing musicians and teachers based on experience. It is well laid out and easy-to-use, reasonably priced, and most importantly, directly applicable! When you know better, you do better, so grab a copy and familiarize yourself with what you should and should not do – you might discover things that you can do that you never realized! You might even find yourself helping your school or district to better operate within the law, and more importantly, set a good example for your students. The Copyright Handbook for Music Educators and Directors provides a concise overview of the key aspects of copyright law that affect music educators and directors in the United States. Designed to provide answers to the most common questions raised by educators and directors, this resource makes it easy to find specific answers and is arranged in a user-friendly question-and-answer format. For ease of use, a thorough Glossary of Terms and an extensive Index are included. Not meant to replace legal counsel, the Copyright Handbook is a starting point for music educators and directors with questions concerning copyright. Topics: How to determine if a work is protected by copyright * The use of print music and lyrics * The use of audio * The use of video * Digital products and the Internet * Performance rights * Composing and arranging. A former band director, Ken taught grade 5-12 band and music appreciation in both public and parochial schools in central Ohio, and joined the Stanton’s team in 2004. His iPod ranges from jazz and funk to classic and alternative rock, and symphonies. Besides music, he geeks out on comic books, amusement parks, hockey (especially the Stanley Cup Champion Penguins), and all things Pittsburgh. 1) Make sure that your student is playing from an original copy, not a photocopy, of music. Stanton’s Sheet Music is excited to be exhibiting at The Midwest Clinic for our third consecutive year on December 14-16, 2016! Join band specialists Kent White, Ken Tilger, and Kris Lehman, “The Jazz Guy” Ben Huntoon, as well as technology guru/computer ninja David Ginter and Stanton’s Sheet Music President Eric Strouse at McCormick Place, Booth #1227. Browse and shop hundreds of titles for wind band, orchestra, jazz ensemble, and solo & ensemble, gift items, and more while taking advantage of their combined 100+ years of sheet music expertise. Trivia and useless knowledge provided free of charge! Ken is a former band director, and has been with Stanton’s since 2004. Besides music, he geeks out on comic books, amusement parks, hockey, and all things Pittsburgh. He’s excited to get NHLTV for Christmas so he can watch the Penguins – Let’s Go Pens! We know you have many choices when it comes to purchasing sheet music, so we want to take the opportunity to highlight just a few of the many reasons why Stanton’s is the best place to buy music for your school, church, private studio or personal use! Besides making it a road trip to Stanton’s to work with our knowledgeable staff, you can also bring your students! While a number of directors visit us on Saturdays or professional days throughout the school year, and some make a summer pilgrimage from nearby states, it is also not unusual for us to see a school bus full of students pull into our parking lot about once or twice a year (don’t worry, we only cower briefly). After a quick “lay-of-the-land” tour, we are happy to turn students loose to shop, and they are welcome to take advantage of our first-hand musical knowledge, as well. Preparations for solo & ensemble adjudicated events provide a perfect opportunity to introduce your students to Stanton’s. What a great use of time, and a unique experience for the students! 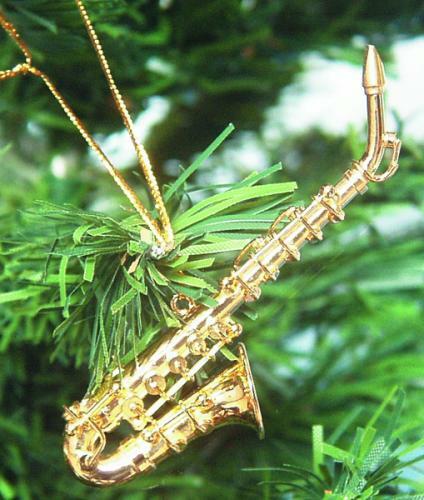 Besides finding their solo or ensemble piece with some guidance from their teacher, they are also free to check out a whole host of method and etude books, pop play-alongs, and holiday collections that are on-hand as well. We often hear from educators who have moved on to other states that they do not have a music supplier like Stanton’s even within driving distance, and many stores do not let customers freely browse all of their titles. Besides having directors take advantage of stopping by the store, what can be better than bringing aspiring musicians (and tomorrow’s teachers!) to musical Candy Land!? For more details or questions, please visit us online at www.stantons.com, or give us a call at 1-800-42-MUSIC! Click here for more information on the STANTON’S DIFFERENCE! If you are reading this, you are probably a musician or associate with musicians. When you are a musician or hang with musicians, you begin to think that everyone is probably involved in music in one way or another. But, we musicians are really a fairly finite group of people. It has been speculated that if you were to gather all people in the United States who make their living in the music industry (whether creating it, performing it, recording it, writing it, teaching it, publishing it, selling it, making and repairing instruments that play it etc), you would end up with about the same amount of people as are employed by the Kellogg’s Company – you know, the cereal and snack food folks. Yeah – a pretty finite group! It seems unlikely that anyone involved in this tight-knit music community would intentionally keep their fellow musicians from trying to make a living. And yet, that’s what you do when you copy sheet music without permission. Sheet music is property – like a trumpet, violin or a microphone – but it’s intellectual property, which can be a bit nebulous. Basically, only the Copyright Holder has the “right” to “copy” their work. When you copy music without permission from the copyright holder, you are actually stealing it. When you copy music without a second thought, that means the music is not being sold. Consequently, the music retailer and all their employees lose income, the music publisher and all their employees lose income, and, perhaps most tragically, the composer loses income. Your fellow musicians are being deprived of their ability to make a living. So not only are you breaking the law by copying music, you are keeping your brothers and sisters in this finite musical community from doing what they love to do: be a musician. If they can’t make a living at it, they may have to leave and do something else. And the musical world becomes an even smaller place. So don’t copy music without permission – it’s not only illegal, it’s immoral. Let’s make sure the livelihood of our music community is secure so we can all continue to make music – that thing we love to do! Dan C. has worked at Stanton’s since 1979, primarily with orchestra music and print promotions. A “working” musician, he’s a classical cellist, a rock & jazz bassist and a folk & country guitarist/singer. His free time is spent with family or reading, gardening, cycling and working puzzles. His series of musical puzzles (RP3 Rebus Puzzle Picture People) can be found on the Stanton’s Facebook page each Sunday. He also has a reputation as a pretty good joke teller. Seriously. We’re 1 week away from the opening of Star Wars: The Force Awakens, and in addition to the numerous toys, action figures, shirts, collectibles, and other merchandise that you’re scooping up don’t forget to program some music from Star Wars on your spring concert or grab an instrumental play-along for you or someone you love. 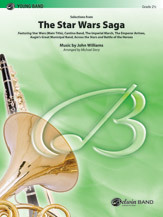 Below are the currently available, best-selling concert band arrangements and solo collections for winds and strings. 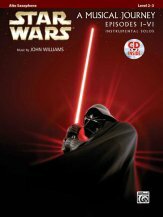 We will update this post as new releases become available – the score to The Force Awakens is just recently finished, so arrangements and play-alongs featuring any new music have yet to be determined (and receive John Williams’ sign-off). If you want to geek out on more Star Wars goodness, check out IGN’s helpful guide to what is now canon, and recent episodes of the Assemble After Dark podcast featuring Episodes I-VI. This new arrangement has been announced, but is not yet available for order. 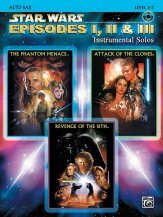 Celebrate the heroes with some of the most beloved music from Star Wars Episodes I-VI! This stunning medley arranged by Jerry Brubaker includes Star Wars (Main Title), Luke and Leia, Battle of the Heroes, Han Solo and the Princess, and The Throne Room. One of the most recognizable movie themes ever written, John Williams’ explosive theme from Star Wars is made accessible to very young musicians in this Carl Strommen arrangement. Great music from the motion pictures Star Wars and The Empire Strikes Back. Composer John Williams’ genius shows in this very playable montage of Imperial March (Darth Vader’s Theme), Princess Leia’s Theme, Cantina Band, Han Solo and the Princess, and Star Wars (Main Theme). 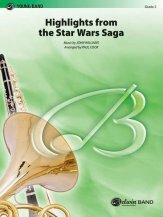 Michael Story has expertly selected and arranged titles from Episodes I-VI of the Star Wars films for young band including: Star Wars (Main Title), Cantina Band, Imperial March (Darth Vader’s Theme), Augie’s Great Municipal Band, Across the Stars, and Battle of the Heroes. 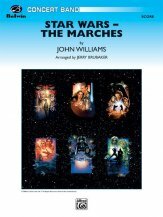 John Williams created so many stunning marches to accompany the Star Wars motion pictures that they had to be combined in one powerful piece. The arrangement features: Star Wars (Main Theme), Parade of the Ewoks, Imperial March, Augie’s Great Municipal Band, and The Throne Room. A serious collection of the most recognized John Williams themes from the Star Wars prequels, the Suite from the Star Wars Epic – Part I contains three movements: Duel of the Fates (from The Phantom Menace), Across the Stars (from Attack of the Clones) and Revenge of the Sith (from Revenge of the Sith). 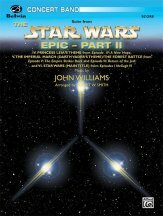 A serious collection of the most recognized John Williams themes from the original Star Wars trilogy, the Suite from the Star Wars Epic – Part II contains three movements: Princess Leia’s Theme (from A New Hope), Imperial March/The Forest Battle (from The Empire Strikes Back & Return of the Jedi), and, of course, the Star Wars (Main Theme). Star Wars: A Musical Journey includes selections from all six Star Wars movies. The wind instrument arrangements in this series are completely compatible with each other and can be played together or as solos, however they are not compatible with the string collections in this series. Each book contains a carefully edited part that is appropriate for the Level 2-3 player and a fully orchestrated accompaniment CD that includes a instrumental demo track followed by the play-along accompaniment track. Also included is both 4-color and black and white art from the movies. These instrumental editions are completely compatible with each other and can be played together or as solos. Melodic ranges and rhythms are carefully considered for each instrument so every tune is easily accessible to all players. 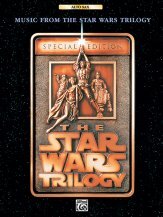 This collection includes music from the original trilogy not available in Star Wars: A Musical Journey – Ben’s Death/TIE Fighter Attack, Han Solo and the Princess, Yoda’s Theme, Luke and Leia, Parade of the Ewoks, The Emperor Arrives, and Victory Celebration. Please note that no play-along tracks or piano accompaniment book are available for this collection. Part of an instrumental series arranged for Flute, Clarinet, Alto Sax, Tenor Sax, Trumpet, Horn in F, and Trombone, these arrangements are completely compatible with each other and can be played together or as solos. Each book contains a carefully edited part that is appropriate for the Level 2-3 player and a fully orchestrated accompaniment CD. Each song on the CD includes a demo track, which features a live instrumental performance, followed by the Play-along accompaniment track. Ken is a former band director, and has been with Stanton’s since 2004. He finds it very hard to believe that The Force Awakens will be the first Star Wars movie he’s seen on the big screen – especially having been born in 1977. He also wonders if the R2-D2 and C-3PO action figures that he and his brother had still exist somewhere in his parents’ basement. “I’ve got a high school brass trio that wants to go to Solo and Ensemble competition. We’re in a state with no required list we have to follow. Trying to read a teacher’s writing, a customer asked for the Hal Leonard “Interception” book. We knew he meant “Intermediate” and also figured he’s a football fan! After that tongue-in-cheek wisecrack, the employee then went on to explain a bit about how the retail sheet music business works. It’s been a while since we’ve added to this series of posts, but we were recently reminded of one more way that Stanton’s is special. Besides making it a road trip to work with our knowledgeable staff, you can also bring your students! Recently the band director from Versailles High School made the trip to Stanton’s via school bus (comfy!) and brought about 20 of her band students along. While she was previewing OMEA required concert band titles, her students were busy choosing their own solo and ensemble selections from our vast selection. What a great use of time, and a unique experience for the students! 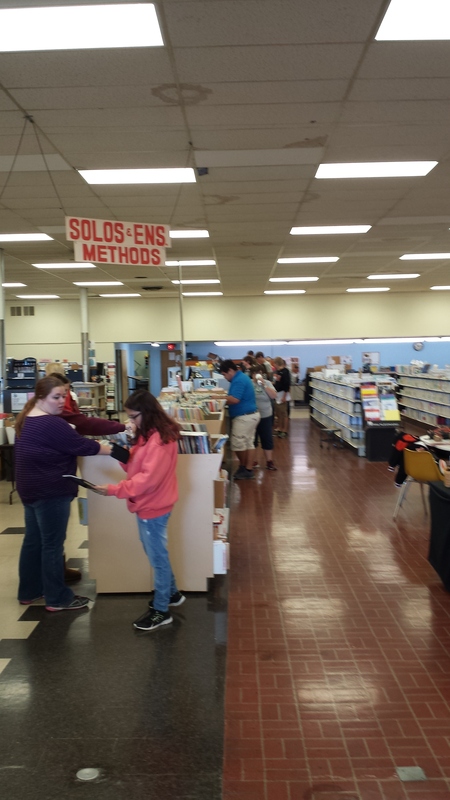 Besides finding their solo or ensemble piece with some guidance from their teacher, they were also free to check out a whole host of method and etude books, pop play-alongs, and holiday collections that were on-hand, as well. Honestly, one of the most satisfying feelings I get from state professional (MEA) conferences is seeing the high school all-state musicians excitedly finding repertoire that they want, books they have been recommended, and music just to play with their friends. It’s the ultimate treasure hunt! While a number of directors visit us on Saturdays or professional days throughout the school year, and some make a summer pilgrimage from nearby states, it is not unusual for us to see a school bus full of students pull into our parking lot about once or twice a year (don’t worry, we only cower briefly). After a quick “lay-of-the-land” tour, we are happy to turn them loose to shop, and they are welcome to take advantage of our first-hand instrumental knowledge, as well. We often hear from educators who have moved on to other states that they do not have a music supplier like Stanton’s even within driving distance, and many do not let customers freely browse all of their titles. Besides having directors take advantage of stopping by the store, what can be better than bringing aspiring musicians (and tomorrow’s teachers!) to musical Candy Land!? Ken is a former band director, and has been with Stanton’s since 2004. He always feels the urge to read Edgar Allan Poe, the original novels featuring traditional Hollywood monsters, and other macabre tales this time of year, yet never does. There’s always a little buzz of excitement in the Choral Department when a new piece by John Rutter comes across our desks. His works feel like old friends, even the first time you hear them – warm and comforting. With his 70th birthday in 2015, both Oxford University Press and Hinshaw Music are re-releasing a number of his most seminal compositions in new Anniversary Editions, with accompanying notes on both the music and performance written by Rutter himself. Rutter’s work has strong footing in both the school and church choral markets, and an especially strong presence in the Christmas repertoire – his recordings with the Cambridge Singers are as Christmassy as the little drummer boy eating fruitcake! Much of his secular music is less familiar, but equally well-crafted and memorable. Seeds Grow to Plants sets a lovely and thoughtful text about the cycle of life, and larger works such as When Icicles Hang and The Reluctant Dragon (which includes the charmingly funny Banquet Fugue) are refreshingly creative. John Rutter was born in London in 1945 and received his first musical education as a chorister at Highgate School. He went on to study music at Clare College, Cambridge, where he wrote his first published compositions and conducted his first recording while still a student. His compositional career has embraced both large and small-scale choral works, orchestral and instrumental pieces, a piano concerto, two children’s operas, music for television, and specialist writing for such groups as the Philip Jones Brass Ensemble and the King’s Singers. From 1975 to 1979 he was Director of Music at Clare College, whose choir he directed in a number of broadcasts and recordings. After giving up the Clare post to allow more time for composition, he formed the Cambridge Singers as a professional chamber choir primarily dedicated to recording, and he now divides his time between composition and conducting. 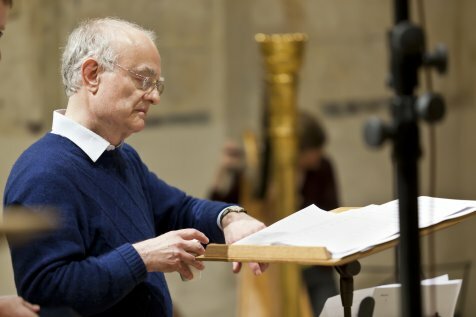 For more information about John Rutter and his music, please visit his website. This article was originally posted Jan. 12th, 2015, and has been re-posted today in honor of the composer’s 70th birthday! Jen Sper has been with Stanton’s since 2006. A former middle school and high school choral director, and an active choral singer and accompanist throughout the Central Ohio area, she also enjoys eating good food, running (to counteract the good food!) and the Muppets. Dan Clark has worked at Stanton’s since 1979, primarily with orchestra music and print promotions. A “working” musician, he’s a classical cellist, a rock & jazz bassist and a folk & country guitarist/singer. His free time is spent with family or reading, gardening, cycling and working puzzles. His series of musical puzzles (RP3 Rebus Puzzle Picture People) can be found on the Stanton’s Facebook page each Sunday. He also has a reputation as a pretty good joke teller. Seriously. Do you have advanced students to whom you would like to introduce some “modern” composers without spending an arm and a leg on a sonata or concerto from a single writer? This new collection is for you! Subtitled “A Variety of Approachable Music for the Advanced Player” these are 24 short pieces or movements from larger works that have been gathered together for study and/or performance. Selections are from such prominent composers as Samuel Barber, Lili Boulanger, John Corigliano, Paul Creston, Bernard Heiden, Karel Husa, Charles Ives, Aram Khachaturian, Boruslav Martinu, Walter Piston, Andre Previn, Sergei Prokofiev, Bright Sheng, Augusta Read Thomas, Virgil Thomson, and Joan Tower and others. There are also nine enthralling pages of notes about the pieces and their composers as well as the dates they were written and first performed, some even written by the composers themselves. Five of the pieces are unaccompanied, but the other 19 have a piano part included. The music is quite challenging as you might expect, but well worth working on, not only to learn some contemporary literature but also to open your students’ ears to modern melodic and harmonic concepts. Attention Violin Teachers! What might make violin students work a little harder on their etudes? How about providing a violin duet part for the teacher (or another student) to play along with the pupil? Since duets can be really fun to play, it will make preparing exercises more palatable, plus it will help improve your students’ intonation as they strive to play in tune with the duet part. This is standard violin pedagogical repertoire – Wohlfahrt’s 60 Studies, Op. 45 Book 1, Studies 1-30, so you certainly can’t argue with the methodology. The interesting violin duet accompaniments by Rachel Kelly (with 4 by Joshua Parman) are at about the same level of difficulty as the etudes themselves. 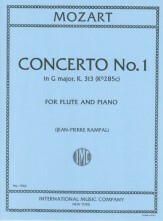 A solo etude part and a double violin score for the duet accompaniment are included in the collection. Something old is new again! 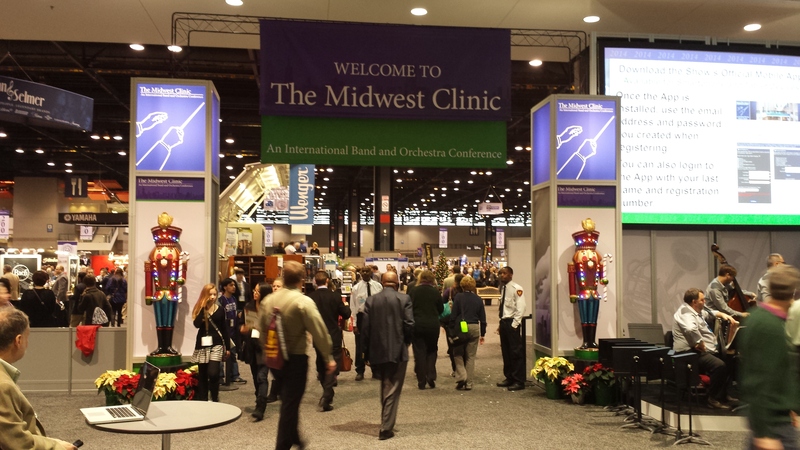 Day 2 of the 2014 Midwest Clinic has come and gone, and it was quite an active day. The Stanton’s booth was busy, especially around mid-day with plenty of educators and students loading up on method books, solo and ensemble repertoire, and new concert pieces. One of my favorite aspects of working our booth is meeting directors that we don’t know, passing along our new band music promotions, and explaining our selection process. Visitors to the Stanton’s booth included our good friend James Swearingen, FJH orchestra composer Lauren Bernofsky, and Hal Leonard arranger Johnnie Vinson. In addition, I had an engaging and enthusiastic conversation with Alfred composers Chris Bernotas and Vince Gassi. Band Education Specialist Kent White attended the session on Scale & Rhythm Chunks by Ohio’s own Richard Canter. It was standing room only with over 500 people attending his session, and we have all but sold out of the copies we had at the booth! One of the other unique elements of The Midwest Clinic is the number of composers and arrangers on-hand. As mentioned above, I spent quite a bit of time today speaking with Chris Bernotas and Vince Gassi, as well as Randall Standridge, Grand Mesa president Walter Cummings, and FJH composers Travis Weller and Brian Balmages. 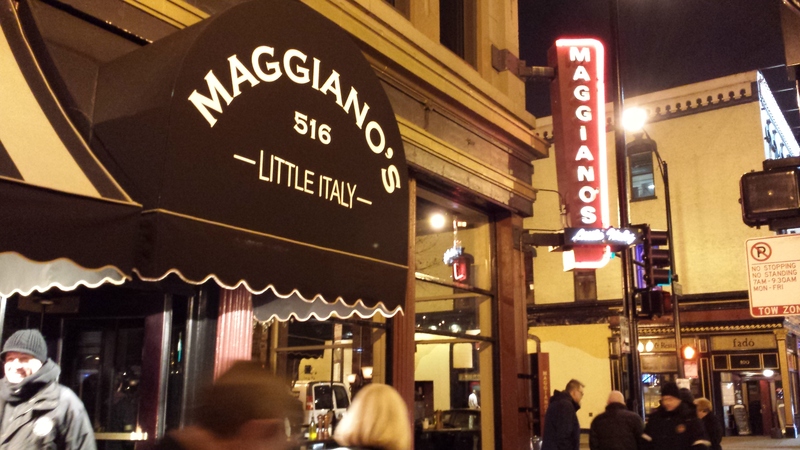 Again our day was capped off wit h a fantastic meal, this time at Maggiano’s Little Italy courtesy of C.L. Barnhouse. It’s in a great historic building that probably dates to the 20’s. 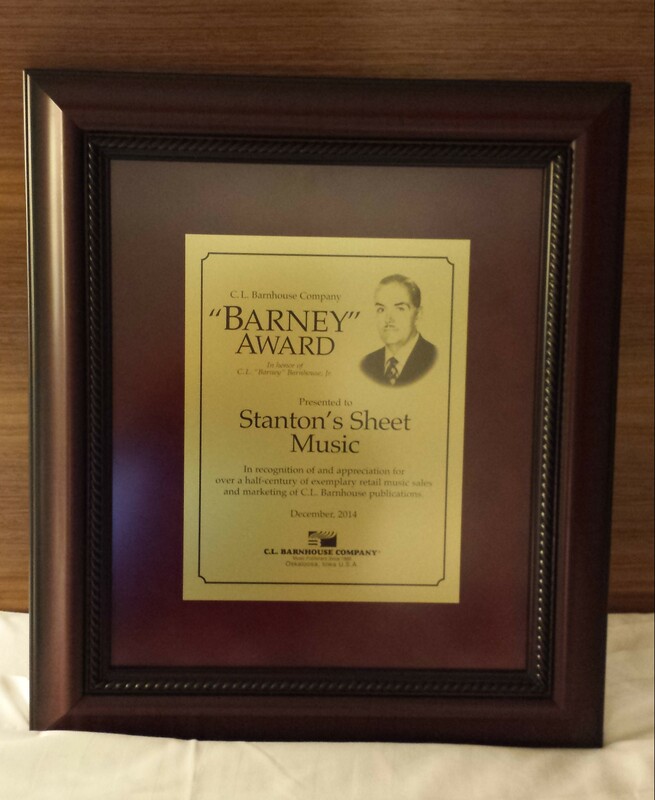 To our surprise Stanton’s along with RBC Music of Texas were honored with the presentation of the “Barney” Award in recognition of our long relationship in selling and promoting Barnhouse titles. A much appreciated and heartfelt presentation was given by James Swearingen. I also got to hear a number of fantastic (and hilarious) stories about Chuck Barnhouse since I was seated between Barnhouse president Andy Clark and Ed Peterson of Omega Recordings, the company that records the Washington Winds. That’s all for today from The Windy City (or Gotham if you’re a fan of the Christopher Nolan Batman Trilogy). Ken is a former band director, and has been with Stanton’s since 2004. He is thrilled to have had gelato and fantastic cheesecake for dessert over the past two nights! Seriously, Cheesecake Factory – meh. 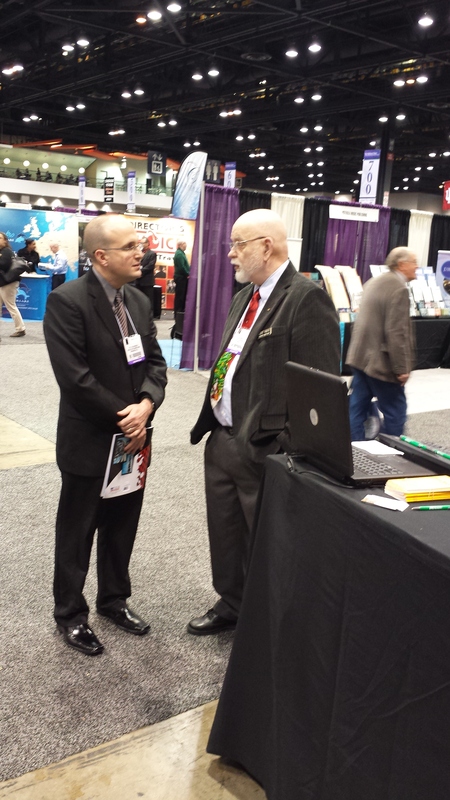 Greetings from the exhibit hall at the 2014 Midwest Clinic! After a full day of set up on Tuesday (check out our time lapse video here), I am excited to share Stanton’s Midwest debut. While exhibit hall traffic was light on our first day, things began to pick up after 1:00 pm as more band and orchestra directors, students and parents began to arrive. As always, it is fun to see some of our Ohio and Kentucky friends and educators at national (and international) conferences. Band directors from Westerville, New Bremen, Lexington (OH), and Louisville, KY were among some of the familiar faces on the first day, along with Ohio State, Capital, and Baldwin Wallace having booths here as well. In addition, we were thrilled to be visited by composer and Columbus native Roger Cichy, educator and 2014 Capital Reading Clinic guest Paula Crider, and Ohio native and staff arranger for “The President’s Own” United States Marine Band Ryan Nowlin. Stay tuned for a Q&A post with First Lieutenant Nowlin in the near future! 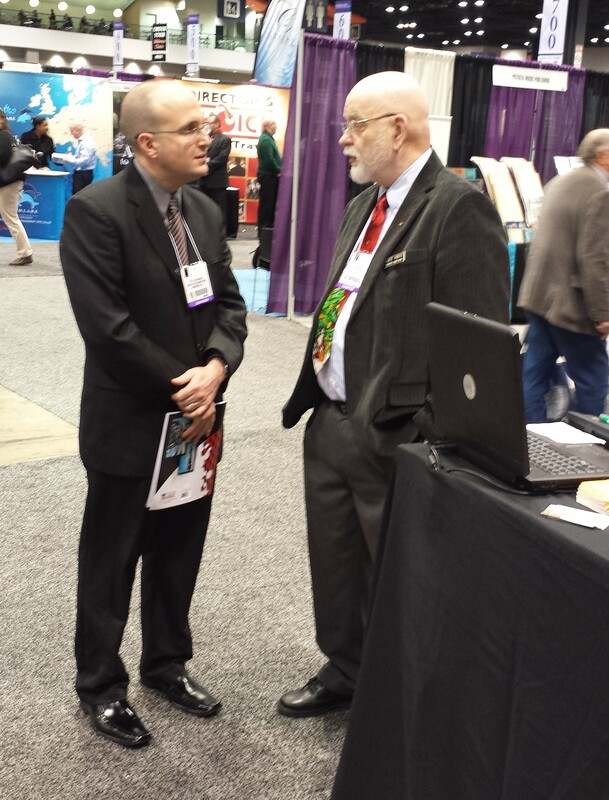 Of course, professional conferences are about making new friends and bringing sheet music to the masses, but they are also great opportunities to speak with our publisher representatives (and sometimes CEOs!) face-to-face about new music, textbooks, and other products, talk about specific ways to improve service, and catch some music industry scoop. The day was capped off with excellent food. The Stanton’s staff is happy to recommend RBC Steakhouse, and Café Bionda where I had fantastic southern Italian cuisine (and gelato!). That’s all for now. Stay tuned for our Day 2 recap tomorrow! Ken is a former band director, and has been with Stanton’s since 2004. He is excited to introduce his son to some favorite Christmas specials this year including How the Grinch Stole Christmas, A Charlie Brown Christmas, and Christmas Eve on Sesame Street. Vintage! The holidays are already upon us. Thanksgiving has come and gone, and Christmas and Hanukkah are just around the corner. 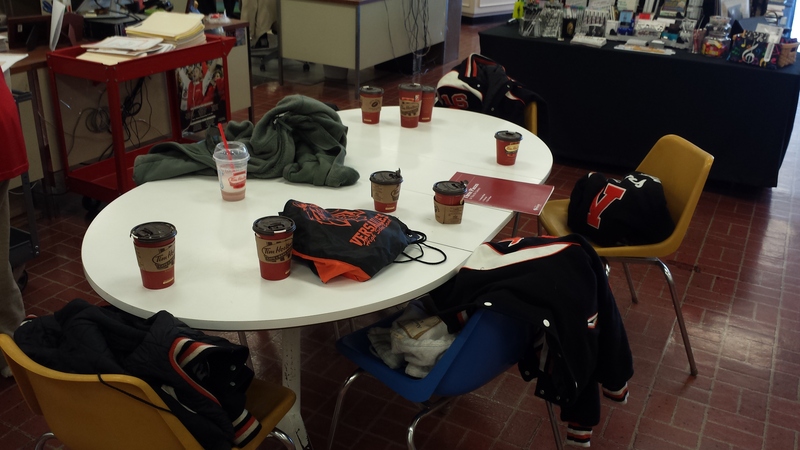 For the Stanton’s staff it means that convention season is also here! This winter we will be exhibiting (and selling!) music at music educators’ professional conferences in New York (NYSSMA), Michigan (MMC), Ohio (OMEA), Kentucky (KMEA), and, for the first time, The Midwest Clinic. These conferences are a great opportunity to talk shop directly with our expert staff, meet customers face-to-face that we may recognize by name (and voice! ), and besides, it gets us out of the store! Ever wonder how our 6-8 booths of music get to your state conference? 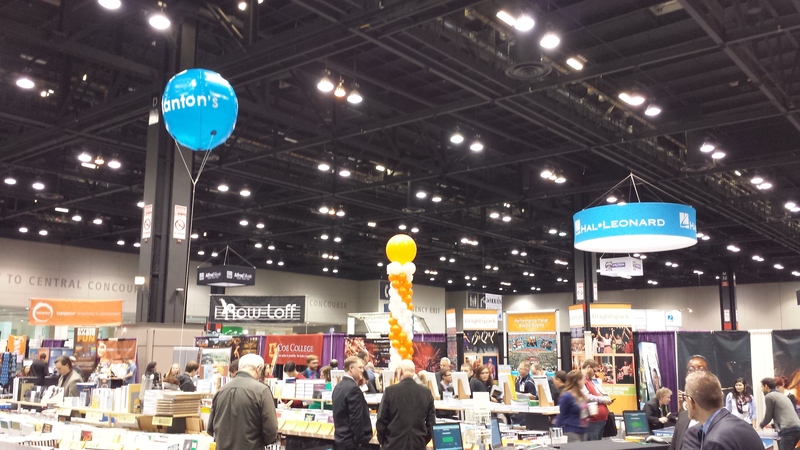 Check out the slideshow below to see how we pull, pack, and transport thousands of sheet music titles and accessory items, and if we’re exhibiting at your conference be sure to stop by the Stanton’s booth (under the big blue balloon) and say “hello”! Ken is a former band director, and has been with Stanton’s since 2004. All he wants for Christmas is a Pittsburgh Penguins tuque, Guardians of the Galaxy on blu-ray, and some heavy-duty outerwear so he can play in the snow with his son this winter! Stanton’s Sheet Music is excited to announce that for the first time in our 50+ year history, we will be exhibiting at The Midwest Clinic, December 17-20, 2014! Join band specialists Kent White and Ken Tilger, “The Jazz Guy” Ben Huntoon, and orchestra specialist Dan Clark, along with technology guru/computer ninja David Ginter and Stanton’s Sheet Music President Eric Strouse at McCormick Place, Booth #1037. 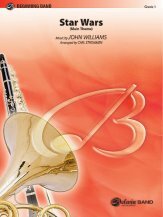 Browse and shop hundreds of titles for wind band, orchestra, jazz ensemble, and solo & ensemble, while taking advantage of their combined 100+ years of sheet music expertise. Trivia, useless knowledge, and jokes provided free of charge! At Stanton’s, we know you have many choices when it comes to purchasing sheet music. Over the course of June and July, we highlighted a few of the many reasons why Stanton’s is the best place to buy music for your school, church, private studio or personal use, and we’d like to add one more reason to your list. Sometimes customer needs and requests require some lateral thought and creativity. A local choral director was in the store this fall, and ventured over to The Dark Side (read: Band Department) because our band department handles our music theory books and software. “I have a Theory 2 student. She’s a flute player, and we’re looking to study the classical period and composition. Do you have anything?” Each of her Theory 2 students is doing an individual study on specific areas of interest to them. 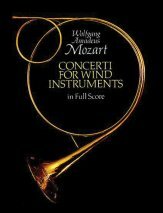 Wait a minute – composition and analysis…Dover has a score of all of the Mozart Concerti for Wind Instruments, and their scores are very reasonably priced. Now we’re talking – both flute concerti should be in there along with the concerti for bassoon, clarinet, and horn. Needless to say, this could not have worked out better for our customer, and her student. Can your sheet music supplier provide this depth of thought and expertise? More importantly, will they take the time? If not, give Stanton’s a try. We’re more than a store or website; we’re an experienced, knowledgeable, and thoughtful staff that has made Stanton’s the “Sheet Music Specialists” for over 50 years! Here at Stanton’s , we’re aware of the rising number of music teachers working outside of their specialty. Cutbacks have forced many instrumental specialists to begin teaching choir-but never fear! In this series, we will try to give some advice on where to start, as well as recommending some “tried and true” products that will help you become a great choral educator! Just when you’ve gotten comfortable with the daily running of your choral group(s), it’s time to begin preparing for Solo and Ensemble festivals. The general procedures for vocal and instrumental music are often similar, but there are some differences that new choral teachers should be aware of. This post will focus on small ensembles. Conducting-Depending on the size of the ensemble, a conductor may or may not be allowed, so consider the difficulty of entrances and phrase endings when choosing music. Be sure to have at least one student who is able to give small conducting gestures for starting, stopping, and changes of tempo. Doubling Parts-Unlike a brass quintet or a flute trio, most vocal ensembles allow for parts to be doubled. Usually there is a limit to the number of singers in an ensemble, but more than one singer may be on a part. Pianists-Don’t forget to engage an accompanist for your groups. Unless they are singing a cappella, vocal groups will need an accomplished accompanist. If you must use a CD or electronic accompaniment, be sure your selection has a CD available. Literature-Small vocal ensembles use the same music as a large choir of the same voicing. For example, a 3 part women’s ensemble (SSA) could use the same music as your women’s choir; a mixed group could use the same SATB music as your mixed choir. Not all pieces work well for small groups though, so use your state’s music list as a guide or check our website for suggestions . As always, individual states’ rules vary. Please check your state rule book for more information. Still not sure what to choose? 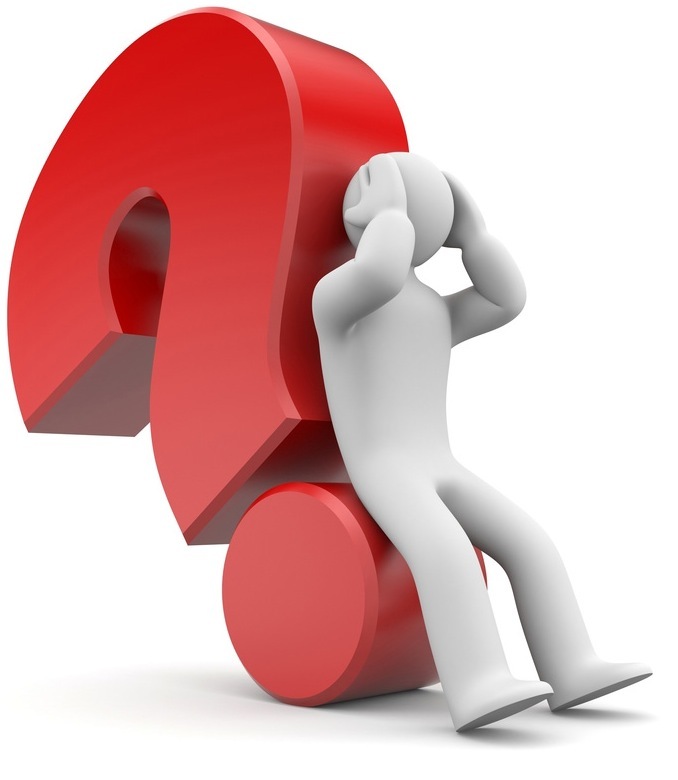 Don’t be shy about asking for help, especially if you are new to the choral world. As always, the experienced choral directors at Stanton’s are thrilled to help you select materials, make recommendations, or give advice. Contact us at 1-800-42-MUSIC, extension 1 or visit our store. We look forward to seeing you soon! Prices are subject to change without notice due to periodic updates from publishers.